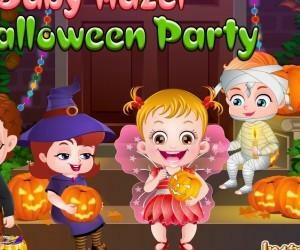 Game Title: Baby Hazel Fun Time! Baby Hazel Funtime is a internet game where the main audience is little girls. In this game you will have to keep the baby happy. If the baby becomes unhappy she will cry and continue to cry until her needs are taken care of or until her happiness bar runs out. This game is angled towards young girls. This game can be played by just the mouse of the computer. No other keys are needed. Within the game there are three levels with varied difficulty. These levels are: “changing the diaper”, feeding the baby”, and “playing with the baby”. Bubbles appear above baby Hazel’s head showing you directions on what to do in order to keep the baby happy. These directions are helpful, except in the feeding stage. When you reach to the bubble that shows the wipes, it is hard to understand that you have to move the wipe around the baby’s face and not just place it there. This game is a bit difficult the first time you use it, but after a few tries it becomes very easy and fun to play. There is a happiness bar that depicts the baby’s happiness. If the baby remains unhappy then the bar runs out and you loose the game. Also in every level there is a time limit to complete the level, even if you are making baby happy. If the time runs out you also loose. At the beginning of each level there is a pop up telling you what you will need to do. All the hints about what to do to pass the level are shown there. At every level the baby’s happiness bar is reset for that level. There are easy, medium, and hard levels. The easiest level is the last level, “playing with the baby”. The medium difficulty level is the first one, “changing the baby”. The second level is the hardest one. All in all, “Baby Hazel Funtime” is a fun and educational game that can be played many times over, and you will always find something new that you didn’t notice before. Enjoy! Hazel is an adorable baby. Mom needs help to take care of her and to keep her happy. Help mom in attending baby Hazel’s needs like changing diapers, feeding and playing. Pay attention to baby Hazel’s needs and fulfill them quickly to keep her happy. She will cry if you make her wait for any of her needs. Good Luck!! And have fun time with baby Hazel. Really good game! My daughters love Baby Hazel.